Each year as part of its budget setting process, the Council looks to allocate a figure to Community Grants. The Council is thrilled to have been able to support local voluntary and community groups and charities every year since its formation in 1999. The grants cover a huge variety of purposes across the town and provide services for a variety of demographics. For full details of the most recent grants scheme, see the Grants page. 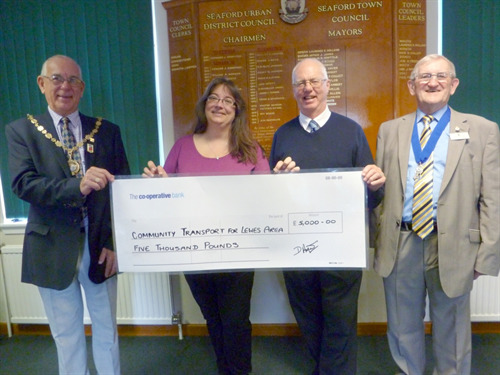 Pictured below: Community Transport for the Lewes Area (CTLA) receiving its grants cheque as part of the 2015 grants scheme.